First I wrote the advanced book. Now, the beginner's book is available! I submitted my annual report as Chair of the ACA Communications Committee for the ACA Business Meeting held in July. I'm currently creating publicity for the winning US Casting Team and for the new ACA casting book. I'm still sorting and organizing all the photo/audio media from the 1940s to 2000 from ACA's Netherton Archive and Collection. Digitizing and sharing could take me a couple years! 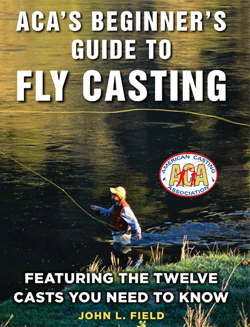 I'm looking forward my casting presentations at the Candlewood Chapter and the Hamonasett Chapter this spring and summer. I'm also pleased to be volunteering for my tenth year for Family Fly-Fishing Day in May with my home chapter, Mianus TU. This spring I'll be fishing Chesapeake Bay, along the Jersey shore and Western L.I. Sound for striped bass. This summer, I'll be fly fishing for school bluefin and yellowfin tuna off the NY and NJ coast. I've also booked a trip this fall to fish for bluefin on the northern coast of France in the Bay of Biscay! These tuna trips are for an upcoming article. Can't wait! The background is cork colored, the main font color is from the anodized reel-seat and the nav buttons and copyright bar are the blank, windings and logo colors. I did this with the use of the Adobe Color CC app and camera on my iPhone. Since I have an Adobe Creative Cloud account, the color swatches appeared in my other Adobe color panels automatically!